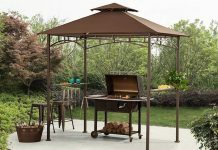 Gazebo certainly increases the beauty of your garden or patio. Not only that, they are sturdy and easy to maintain. 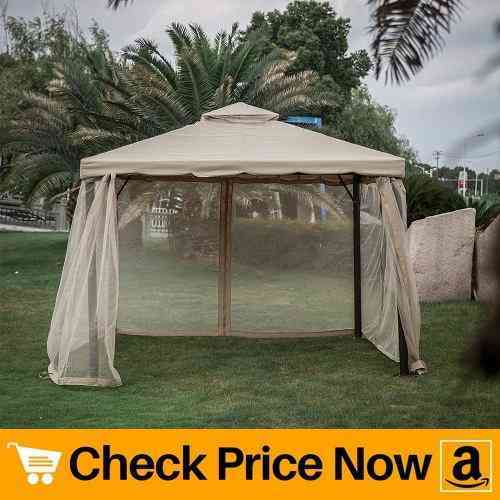 And buying a best gazebo with mosquito netting provides shelter around the year along with protecting from mosquito bites. Not to mention, but mosquitoes carry a variety of viruses and pathogens that prove to be harmful to you. 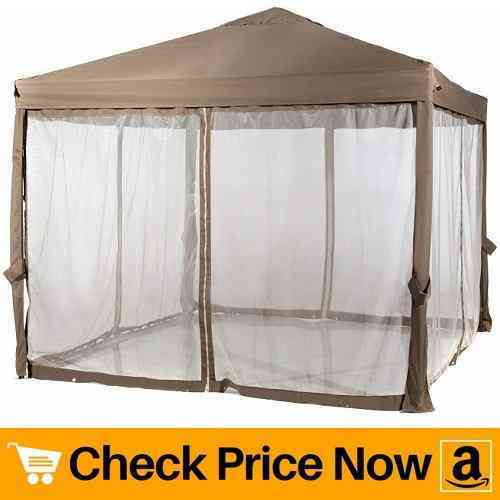 So the best way to prevent these insects from entering your shelter is to buy the best gazebo with mosquito netting. If you love spending time outdoors and need extra flexibility, then gazebos are a perfect option. Apart from providing shade during summers, they also protect yours from the rain. Along with that, the gazebo canopy helps in maintaining a perfect temperature inside the shade. 7.1 1. Why Pick 10 x 10 Gazebo over other sizes like 10 X 12 or 8 X 10? 7.2 2. Why Do You Need Mosquito Netting All The Time? So what are you waiting for? Go through our 5 best gazebo with mosquito netting and buy yourself a perfect product that lasts for years. 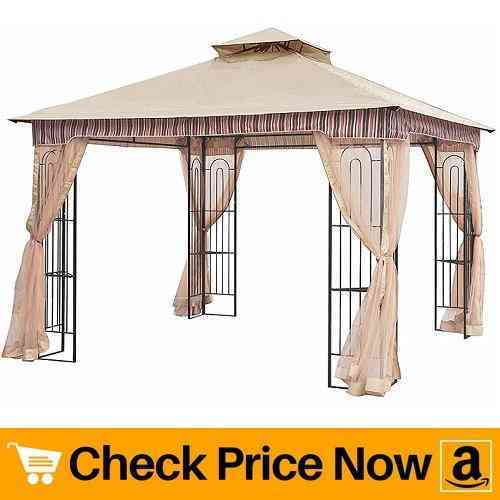 We begin our reviews with sunjoy 10×10 gazebo with netting. Its cured metal pattern on four corners gives this product an amazing look. Plus you can place a small plant or outdoor decor on the corners of metal panels. In turn, it makes the interior look beautiful and comfortable. Soft-top canopy increases the stability of the product as well as maintains cool temperature beneath the shade. In addition, 100% polyester material of canopy gathers less dust and is easy to clean. Hence, this product is water resistant but not waterproof due to a soft top. Speaking about the mosquito net, it is tightly weaved in order to keep out small bugs and insects. Also, the netting comes with plastic hooks which makes it easy to install and clean. Entry and exit from the shade is easy due to full zipper present in the center of the 10 x 10 gazebo. Installation of this product requires two people. Though you can install the product all by yourself it will require a lot of time and you might not get a perfect finish. So it is better to ask your friends or family member to help you set the gazebo. The package includes stakes in order to make the unit safe and secure. 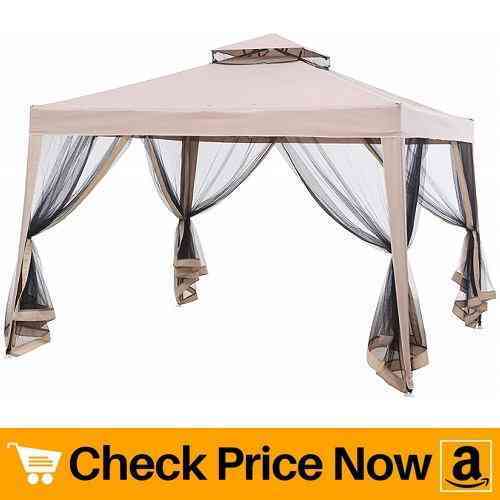 Plus you also get sunjoy 10×10 ft replacement canopy for gazebo, in case it gets damaged or torn. So conclusively, this 10×10 gazebo with mosquito netting is spacious enough to fit 6-8 people. Its high quality built materials makes the products strong and durable. Thus, share a laugh, relax or dine with your loved ones under the shade. Moving ahead, we have another best budget 10×10 gazebo canopy. The sturdy steel construction of the frame with high-grade powder coating resists chipping, peeling and rusting. Apart from that, it is built using quality materials which makes the product durable for years. Plus the 10×10 canopy gazebo have enough room to fit 5-6 people along with table and chairs. Double wind vent at the top of canopy ensures proper airflow. In turn, it prevents the unit from blowing away or turning over due to a strong breeze. 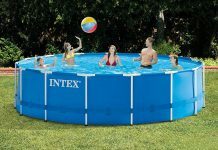 Also, the material is waterproof which means no need to take the unit down during the rainy season. Thus, makes it perfect for both, summers and monsoon. Fully enclosed mosquito screen prevents mosquitoes, tiny insects and bugs from entering the gazebo. It features 4 fully zipper closed doors for easy entry and exit. Nylon mesh fabric of the screen is durable and easy to clean. Overall, this product is easy to assemble and install. 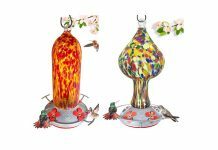 It is ideal for outdoor events, camping, picnics, parties, etc. And more importantly, it is inexpensive and long-lasting. Therefore, the quality and durability of this product will withstand bad weather and provide you shade for years. If you wish to have a product with extra stability support without spending extra dollars then this one is for you. This sunjoy 10×10 gazebo is just what you need. It includes guy ropes which provide additional stability. In turn, it holds the unit firmly during a strong breeze and prevents blowing away. The unique fabric covering over the poles makes it look attractive. Apart from that, full mosquito netting from all four sides prevents tiny bugs and insects from entering in. Thus, enjoy happy moments with friends and family without getting itchy bites. The plastic base at the end of poles makes it easy to install a gazebo in the garden, patio or deck. In case if you wish to install the unit in concrete or cemented patio, make use of anchors. Besides, the single wind vent at the top maintains proper airflow under the shade. It also helps to keep the temperature cool and comfortable. Overall, we can conclude that this product possesses great stability and is cheap. The 10×10 ft gazebo canopy is large enough to shade 6-8 people. You can also hang lights on the small hole present in the center. The canopy cover is water-resistant but not waterproof which means you need to take the unit down during monsoon. When outing combines with privacy then it becomes a perfect evening for couples. And here we have a perfect product for them. 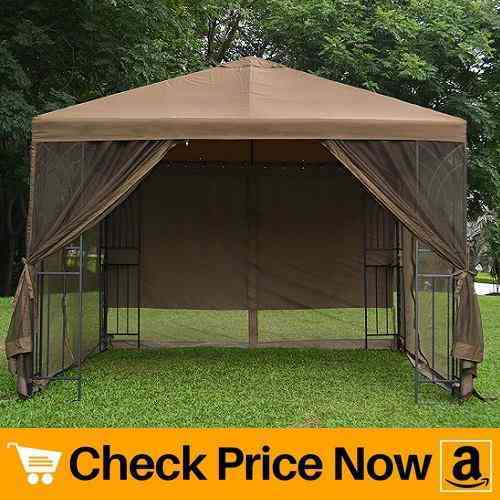 This 10×10 ft gazebo comes with a mosquito net as well as a privacy screen. Apart from that, its beautiful tan color along with steel frame design makes the whole unit look magnificent. Talking about the canopy material, it is 100% polyester fabric. The fabric is UV resistant, standard fire-retardant and water-repellent. It also has grommets to drain water in case of a downpour. Thus, makes the cover strong and durable. Similar to the majority of the nets, this one also has 4 full zippers for entry and exit. Strong nylon mesh stays firm and prevents bugs and mosquitoes from entering the gazebo. Plus the privacy screen makes it ideal to shade hot tubs present outdoor. The 4 plant holders present on each corner of the frame allows you to place plants or any decor. 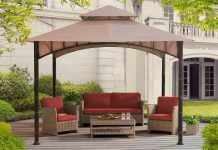 In turn, it makes the interior of the gazebo beautiful and comfortable. Also, wind vent at the top maintains cozy temperature under shade. Last on the review list we have 10 x 10 screened gazebo tent. The simple yet strong design is easy to set up. 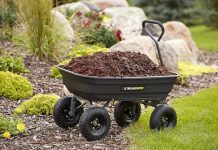 It goes very well in your backyard, lawn or garden. Powder coatings on the metal frame are rust resistant and durable. Thus, you can use it for years and years. It features a mosquito net and privacy screen which makes it one of the best gazebo for outdoor. The net stops mosquitoes and bugs from entering in while the screen blocks strong sun rays. Apart from it, it also prevents you from gusty winds. Therefore, privacy curtains make the unit ideal for outdoor hot tubs or spa. Super easy installation makes this product worth the money. The whole unit gets set up in 15 minutes. Plus the anchors hold the tent firmly on the ground. So all you get is a strong and sturdy product that lasts for years. Similar to other products on the list, this one also contains a wind vent at the top. To increase life span, always close it during harsh weather conditions. Apart from that, this gazebo is ideal to provide shelter in events like wedding, birthday parties and picnic. Moreover, it is budget friendly which means you get all the benefits of gazebo without spending many dollars. Here we end our 5 best 10 x 10 ft gazebo with mosquito netting. We have thoroughly studied the products before including them in the list. Always make sure to trim the grass in your garden or backyard before installing gazebo. 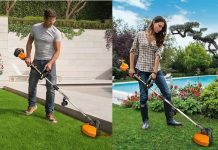 You can check out the list of good string trimmers here. However, hope you find the perfect product that lasts for years. Go through the buyers guide section below, it will solve some general question regarding gazebo and mosquito netting. 1. Why Pick 10 x 10 Gazebo over other sizes like 10 X 12 or 8 X 10? There might be a question about why to choose a 10×10 ft gazebo over other sizes? First and foremost reason is, 10×10 gazebo size is spacious enough to fit 6-8 persons easily. Apart from that, you can place chairs and a medium size table and still have quite a room to place plant or decor inside the shade. Another reason is, mosquito screens are easily available for this size. In case, your net gets damaged or rips due to certain reasons, you can get a replacement easily. Also, it is cheap as compared to other sizes. Lastly, installing a 10×10 ft gazebo is very easy rather than other available sizes. You get a clear idea of what to assemble which makes the workload less. And of course, square shape never gets out of fashion, which is why you should choose the size of 10×10. Check our review about 10×12 Sunjoy gazebos. 2. Why Do You Need Mosquito Netting All The Time? Mosquito breakouts are more common during the late winters and summer season. And summer is a perfect time to spend time outdoors, throw a barbecue party, etc. In order to get rid of these tiny annoying insects, you need to have a mosquito net. Not just it will save you from itchy bites but will also prevent fatal diseases caused due to a mosquito bite. If you’re planning to place your gazebo in the garden or patio, you will definitely encounter garden insects. And having a mosquito net prevents entry of garden flies, small insects and bugs inside shade. Thus, you can comfortably spend time in your space without worrying about itchy bites.